how Imperial Cormorants (Photo by Jerzy Strzelecki/Creative Commons via Wikipedia)the marine bird dives to the bottom of the ocean in search of food. The research was conducted in a protected coastal area of the Patagonia Region of Argentina known as Punta Leon. The area is home to more than 7,000 cormorants. A camera was attached to the back of one of the birds and filmed as it went on its dive for food. By using the camera they were able to see first-hand the underwater behavior of the birds for the first time. The video shows the bird making the 150 foot dive to the ocean floor, using its feet to push itself down,and then explore the vast area on its quest for food. It finally catches a small fish and returns to the surface to eat. The team has been studying the birds for ten years and are identifying areas for optimal feeding and make sure those areas are protected. They also hope that this research will allow them to understand how environmental conditions affect the birds. 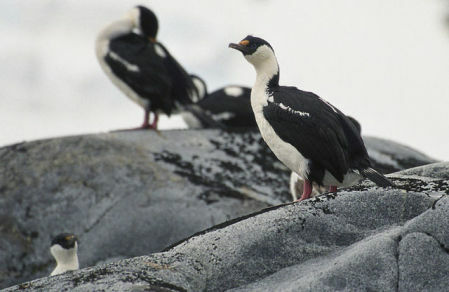 Cormorants are not considered to be a threatened species overall, though some subspecies are exceptions. Understanding the lives and behaviors of the birds may help keep them from ever being considered endangered..